Enjoy our comprehensive lawn fertilizer program which not only provides your grass with the nutrients it needs to thrive, but is guaranteed to keep your lawn free of weeds and grubs all season long. Not only do we provide unlimited free service calls but we have 35 years of experience to make sure your diagnosis and treatment plans are the best for you and your grass. 1st application: March – Early spring fertilizer & pre-emergent weed control. 2nd application: April/May – Late spring fertilizer& broadleaf weed control. 3rd application: June – early summer fertilizer & broadleaf weed control. 4th application: July /August – Late summer fertilizer & broadleaf weed control. 5th application: September – Fall fertilizer & broadleaf weed control. 6th application: Oct/Nov Early winter fertilizer for faster spring green-up. Aeration can be done at any time except when the temperatures are extreme (90 + degrees). 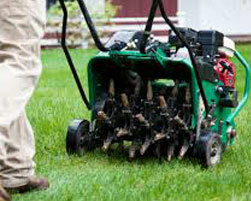 We recommend aerating first thing in the spring when the ground is still soft and temperatures are cool. Aeration helps to open up the soil to allow the plant to breathe better and enhance the ability to accept nutrients and water. 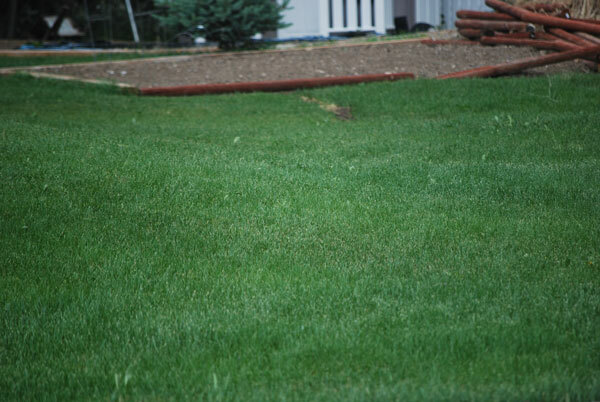 Compacted soil restricts root growth causing the lawn to become thin and damage easily. The dirt deposit encourages microorganism activity which helps with the decomposition of the thatch layer.Aeration is recommended to be done annually. A Sod webworm is the larvae of a moth that feeds on the crowns and stems of the lawn causing the top to die off. Our trained state certified technicians can relieve the lawn of the pressures caused by these destructive insects. 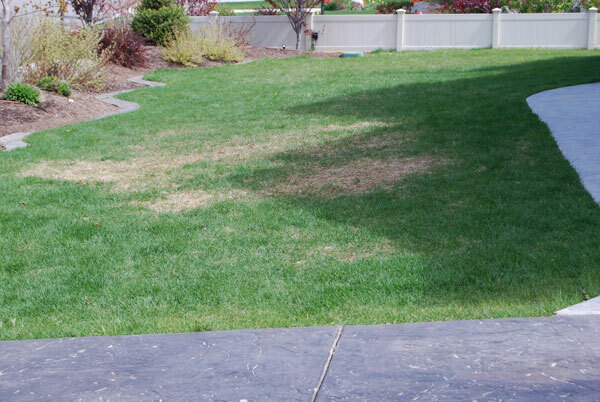 Sod Webworm refers to several different types of Pyralid Moths found in the state of Utah. Sod webworm larvae cause damage to the turf by feeding on the plant just above the crown separating the blade from the roots causing dieback. Symptoms appear as small brown patches in the early stages. These patches then encroach on each other making a large dead area. Damage can become severe in a very short period of time. Sod webworms spend winter as partially grown larvae in silk lined chambers in the thatch or soil. In spring they resume feeding and grow rapidly then pupate. The moths emerge 10-20 days depending on temperature. Sod webworm adults are small, dull-colored moths with a wing span of ¾-1? Mating occurs soon after emergence, and females usually start laying eggs the next night. Egg laying begins at dusk and continues for a couple of hours. Eggs hatch in 1-2 weeks and complete their development in 4-7 weeks. They then make a tube like silk lined tunnel in the thatch and soil. Older larvae feed mainly at night, chewing down foliage around the burrow. Damage appears as small dead patches but progresses rapidly. Full-grown larvae range in size from ?-1 inch long. Because of the climate in Utah we get two generations per year; spring and fall. Reducing drought stress and regular fertilization will increase the vigor of the lawn which will aid in withstanding a grub infestation. We can schedule a sod webworm prevention treatment in March or August which will help you to not get the damage in the first place. Schedule early to ensure being done at the right time. Treatment can be done anytime grubs are present in the lawn. In order to minimize the damage caused by these pests, early detection is essential. 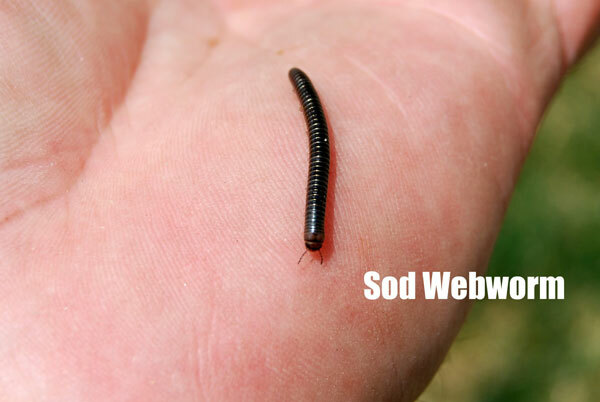 If you suspect that your lawn may have sod webworms in it, do not hesitate to contact us. We will have a certified technician come out and diagnose the problemand suggest a solution. Damage can become severe in a very short period of time. Do not hesitate to call and have a certified technician treat the lawn to keep the damage to the lawn to a minimum. If insects are treated early, damage will be limited and your lawn will likely recover quickly. 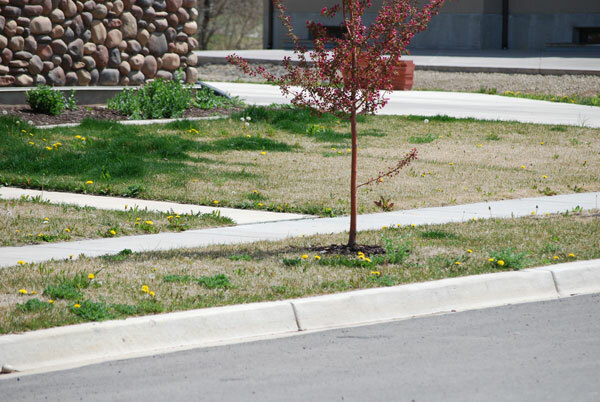 If damage is extensive, your lawn may take longer to recover. If after a couple of weeks you do not see improvement, please call us. If population was high, a re-treatment may be necessary. Rake through thatch not removing it but fluffing it up, then over seed with a variety identical to the rest of the lawn (most lawns in our area are “Kentucky Bluegrass”). Sprinkle with water and maintain moisture in seeds until germination (2-4 weeks depending on time of year). 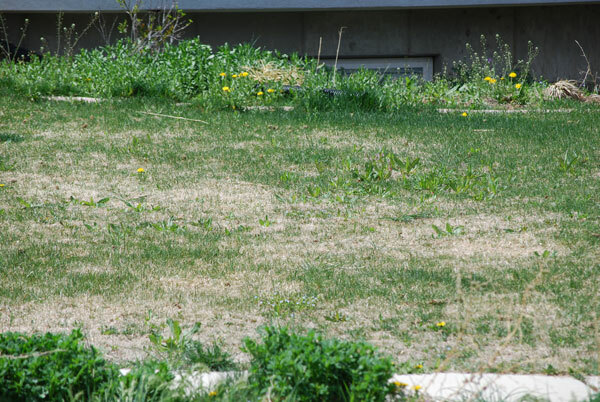 Give your lawn a little TLC until it’s healthy again. Cut out dead areas and replace with sod. Keep sod moist for two weeks or until the roots hold turf firmly. If you have had problems with grubs in the past a preventative treatment in the springtime is recommended the following season. 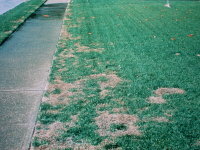 Summer patch is one of the most destructive diseases of Kentucky Bluegrass in our area. Summer patch infects and destroys roots, crowns and stolons and over time will absolutely ruin a lawn if gone unattended. Our certified technicians can properly diagnose this problem and apply treatments to minimize damage to the lawn. Symptoms first appear in May-July or when temperatures are above 80-95 degrees. Damage appears as wilted, drought stressed turf. The affected areas soon turn a straw like color, leaving patches that appear crescent or circular shaped. Healthy turf may persist in the center of affected patches producing “frog eye” symptoms. 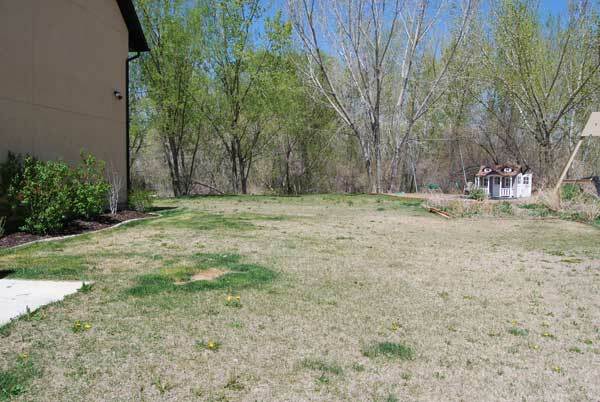 Severe damage causes an uneven, bumpy lawn with complete dieback of areas that can take a great deal of time and frustration to recover and smooth out. Damage is more severe in full sun and other very warm areas such as those against walls and along sidewalks or driveways. Light, frequent watering and/or drought stress followed by warm and wet periods are factors that promote the spread of this disease. Other ways of spreading this disease include: Foot traffic, wind, lawn mowers or anything else that comes in contact with infected areas, moving spores from one area to another. Compacted soils with poor drainage are the most vulnerable for this disease. Unfortunately there are a lot of neighborhoods in our area that have very clay like soils that fit this criterion. Low mowing and improper watering are conditions that property owners provide to support disease development. 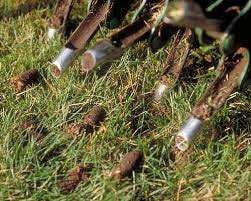 Aeration: Opening the soil to allow it and the lawns roots to breathe is critical in preventing this disease. Annual services in the spring in most situations is sufficient but in soils that have a high clay content a second service just before the hot season makes a big difference. In these severe cases a top dressing of sand applied to the surface at a thickness of approximately ½-3/4” immediately after aeration tends to fill these holes not allowing them to close back, allowing water and nutrients to penetrate easier. Roots tend to develop in these holes much better than in the hard clay. Mowing height: Close mowing tends to aggravate this disease. Keep a relatively high mower setting (3”+) in lawns that suffer from summer patch. This promotes healthier turf with better root development and higher levels of nutritional reserves needed for stressful periods. Always wash every blade or clipping of grass off of your mower after each cutting to prevent spreading this disease. If you borrow or loan out a mower always wash the equipment between properties. The fungus spores attach to anything. Irrigation: Watering should be done no more than three times a week during high heat periods and the top layer of soil should be allowed to dry out between each watering. While each lawn has its own specific needs a guideline for watering would be to achieve ¾” per watering and never every day, regardless of the condition of the turf. DO NOT apply water lightly and frequently. If you experience runoff when achieving this amount of water break the cycle time into two or three parts to allow water to penetrate and allow the soil to ready itself to absorb more water. i.e. 30 minute station watering broken down to 10 minutes for 3 cycles or 15 minutes for 2 cycles. These cycles need to follow one after the other to finish in one morning or evening; this allows the ground to dry out between watering days. When temperatures are cool achieve the same amount (maybe slightly lighter) of watering per station but cut the watering days back to once or twice a week. Treatments: Chemical treatments are most effective when applied as a prevention strategy before symptoms show up (April-May). When symptoms are present these products only aid in suppression of this disease, however necessary to avoid severe damage. 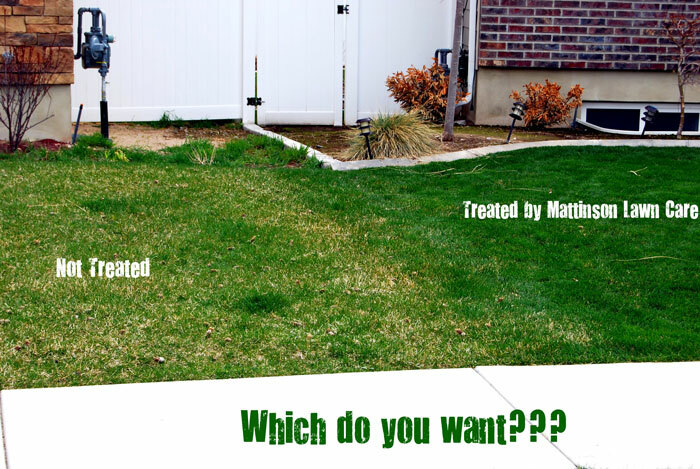 If your lawn or your neighborhood has a history of disease, prevention treatments are necessary. Prevention treatments need to happen every year that fungus is a threat in your area in order to reduce the chances of your lawn contracting this disease. In summary, there are no “silver bullets” when it comes to managing this disease. Proper practices aimed at reducing turfgrass stress and promoting healthy root development, along with the use of preventive fungicide applications, is often the long term management strategy that leads to the successful outcome of this difficult and challenging turfgrass disease. If only you had called Mattinson’s. The lawn would be lush and green and most importantly…. MOWED! Wouldn’t it be nice to enjoy your time off, truly having the time off? You need to enjoy your time doing the things you love while we take care of the stuff that you don’t. Let Mattinson Lawn Care make your yard something to be proud of!Mattinson Lawn Care guarantees your satisfaction and our pricing is competitive. You can’t go wrong. It’s time to grab the lawn chair, fishing pole and kick up your heels… everything’s done! 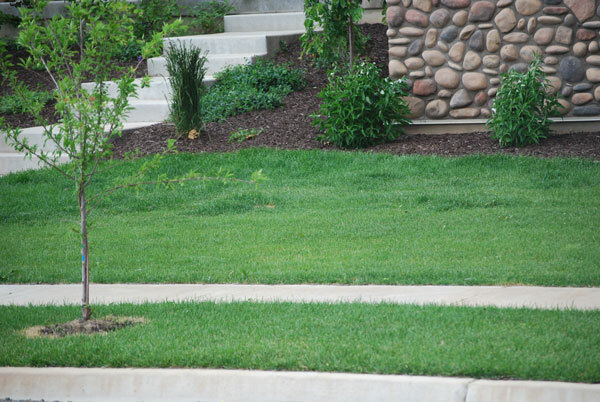 Whether you have tunnels or mounds throughout the lawn we can get rid of the problem. We also have methods for prevention to avoid the problem in the first place. Whether your issue is with mice in your home, or gophers in your yard, all rodents carry diseases and can reproduce quickly. Do not let the presence of these pests put your family’s health at risk. At Mattinson Pest Control, we use our years of local experience to eradicate your rodents quickly and safely. Contact us and get the peace of mind of a guaranteed service. Billbugs are the larvae of a beetle that feed on the roots of the plant (lawn) causing the top to die off. Our trained state certified technicians can eliminate the stress on your lawn that is caused by these destructive insects. More info: Billbugs are among the most misdiagnosed pest of turfgrass, affecting bluegrass from late June to early August. Many turf managers confuse billbug damage with symptoms of drought stress, diseases such as summer patch, dollar spot or injury from white grubs. Adult billbugs feed by chewing holes in grass stems but adults only cause minor damage compared to the larvae. Mature larvae are about 3/8” and cream colored with a brown/copper head. Gradual thinning, yellowing, wilting in spite of adequate soil moisture, and appearance of scattered irregular dead patches. If billbugs are left untreated females can lay five eggs per day and spots will increase in size and eventually join together to create one large spot. The following year the infestation will usually be more severe. Soil remains firm, not spongy under foot as with white grub infestations. We can schedule a grub prevention treatment in April – May depending upon the temperatures and other environmental factors. Schedule your treatment early to ensure it is done at the most effective time for that particular season. Treatment can be done anytime grubs are present in the lawn. In order to minimize the damage caused by these pests, early detection is essential. If you suspect that your lawn may have sod webworms in it, do not hesitate to contact us. We will have a certified technician come out and diagnose the problemand suggest a solution. After treatment, affected grubs usually take several days to show a decline, turning a yellow or brown color. If after a couple of weeks you do not see improvement, please call us. If population was high, a re-treatment may be necessary.